Do You Have Problems With Your Job Or Employer? Call DOLE Hotline 1349! Are you having problems in your workspace? It could be a problem with your boss, a problem with your employer, a problem with the company you're working for, or a problem with the job itself. Whether you think you are being maltreated or unfairly treated, you can always get in touch with the Department of Labor and Employment for help and assistance. The department's main gateway for inquiries, questions, and complaints from employees is their DOLE Hotline 1349. The hotline was specifically established to cater to complaints and questions from Filipino employees. It's available for all Filipinos, whether he/she is employed locally or overseas. The line is open 24/7 which means you can call them any time of the day or night. You can always call it from your fixed-line phones. You can also use it to report instances of illegal recruitment, child labor, unfair contractualization, and other violations of labor laws. 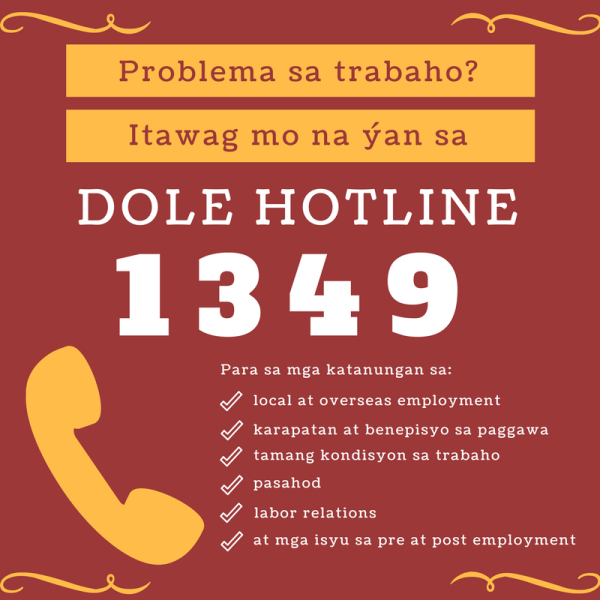 Some of the issues you can raise using the DOLE Hotline 1349 include the following: local and overseas employment, rights and benefits from your job, fair conditions at your job, wages, salaries, labor relations, and issues with regards to pre-employment and post-employment. When you contact DOLE and a representative answers, you should be very specific with your inquiries and complaints. The more specific you are, the better answers you will get. According to the department, there are at least ten (10) assistance officers manning the operation at any given time. These are DOLE employees who are knowledgeable and experienced about all issues concerning labor issues in the Philippines. In the event that you can't contact DOLE through the phone, there are other avenues on how you can reach them. You can visit the official website of the department and visit their contact page. There's a link there which will direct you to submit a legal query. You can also visit the official website of the National Wages and Productivity Commission or get in touch with them on Facebook.